Welcome Alma back to the Urbana-Champaign campus at a rededication ceremony with song and speech to celebrate her return. The campus community is invited to attend the Rededication Ceremony for Alma Mater, the iconic sculpture created by alumnus Lorado Taft. 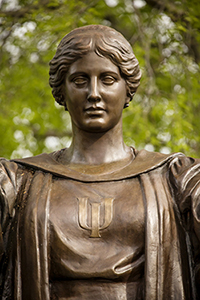 The sculpture will be rededicated with song and speech on Friday, June 6, beginning at 10 a.m. at Alma Mater Plaza, located at the southeast corner of Green and Wright streets in Urbana. Dr. Jean Taft Douglas Bandler, a grand-daughter of Taft and daughter of the late U.S. Sen. Paul Douglas, of Illinois, is scheduled to speak at the ceremony, as are Chancellor Phyllis Wise; Andrzej Dajnowski, the lead conservator from the Conservation of Sculpture and Objects Studio; and Christa Deacy-Quinn, the collections manager for Spurlock Museum. Deacy-Quinn will be representing the Alma Mater Conservation Committee. Ollie Watts Davis, a professor of music at Illinois, will sing “Illinois,” the official state song. Commemorative t-shirts and holographic magnets that show Alma Mater before and after conservation will be given out to the first 250 attendees. The sculpture's 85th "birthday" is June 11. Alma Mater was originally dedicated on that date in 1929. Cupcakes will be available after the ceremony, and a birthday card will also be available for guests to sign - it will be displayed in the Illini Union. In case of inclement weather, the ceremony will be held in the South Lounge of the Illini Union.